Wolves hunt in packs. One wolf is no match against the formidable majesty of an elk. But a pack of wolves can take down the beast without much effort, and share in its spoil. At first glance, zombie behavior seems to match that of wolves—hunting in packs, following their prey until it becomes fatigued, and sharing in the bounty. However, differences remain. This is Monday Mayhem, and these are my thoughts regarding zombie pack hunting. Except for a few films, the majority depict zombies as pack hunters. The typical scenario involves a human stumbling in the midst of a zombie infested feeding ground and becoming the quarry in a quick game of cat and mouse against a horde of undead. For the pack hunter idea to hold true, it would mean zombies would have to exhibit some form of intelligence in order to coordinate attacks against their victim. Given what we know about zombies—their lack of intellect, agility, and cooperation—coordinated attacks seem unlikely. Wolves, on the other hand will organize into groups, stalk their prey, and give chase until it falls by the wayside. Should the prey enter a body of water, the pack will lay low while two or more of the ravenous killers stand guard by the edge. Another difference with zombies and known pack hunters lies in their organization. A pack’s classic configuration contains an Alpha. He’s the dominant male that leads the pack to perform dastardly deeds of horror. Chimpanzees demonstrate this attribute in the wild when two males vie for the top position in the clan. A good example of the Alpha male conflict plays well in the movie Rise of the Planet of the Apes. 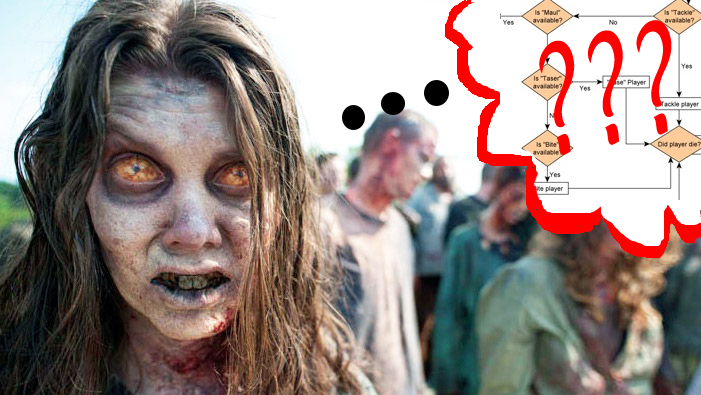 So if differences exist between the animal kingdom and zombie packs, what kind of hierarchy do the undead follow? Zombies function on instinct. Yes, very much like animals. The main component to their internal makeup is their sense of tracking. When one of them spots a potential victim, others in the vicinity respond likewise. You might want to call it a built-in GPS. You can see this behavior at work in movies such as Dawn of the Dead and 28 Days Later. Other than I Am Legend, which some consider a vampire flick, the Alpha male is missing in popular zombie movies. If anything, the undead act upon external stimuli in a uniformed and structured fashion. If one smells human, they all smell human. Thus, the chase begins. Soldiers can eliminate the front line of an advancing undead army, but zombies are too dumb to know when to give up. They’ll continue forward until every human becomes the evening’s main dish. Inasmuch even I would enjoy seeing zombies emulate wolf pack behavior, the undead have their own agenda. I’m sure one day someone will come up with the idea of having an Alpha male leading a pack of zombies through an apocalypse. Until then, we have to wait and enjoy what we currently have at our disposal. I must disagree with those who claim (a la The Walking Dead) that zombies hunt in packs (other than perhaps Big Daddy as an Alpha in the oddball Land of the Dead). In my opinion, every zombie is an autonomous agent looking out only for itself. However, much like ants and other social insects, the behavior of many zombies together produces what’s called “emergent behavior.” For example, one ant alone is lost, seems to have completely random movements, and will usually die fairly quickly. When a colony of ants works together, even though every single ant would be lost and purposeless, the group as a whole hunts, builds structures, and so on. How can this be, and why might zombies be like this? The answer lies in the fact that complex emergent behavior in a group can arise from a simple set of rules used by each individual. (See a nice demonstration at http://math.hws.edu/xJava/CA/CA.html.) The rule may be as simple as “If I am close to another individual like me, keep a certain amount of distance. If it turns, follow. If there is no one in front of me, follow the individual behind me. If there is no one next to me, seek food and navigate toward it.” In these simple rules (or something very much like them), we get the flocking behavior of birds, for example. One bird by itself is kind of stupid, but together you have the Swallows of Capistrano. I believe zombies would work the same way. Since every zombie is a mindless entity, it would be contradictory to say that (a) one of them would be differentiated enough to be a leader or that (b) any other zombies would recognize that zombie as a leader anyway. Far more likely, and far more in keeping with other beings in the natural world with little or no cognitive power, is that part of being a zombie is being imprinted with certain rules like “When possible, pursue food and eat” and “when individual next to you moves, and you have no eating to be done right at that moment, follow that individual.” This way, if one zombie spots prey and goes after it, even the zombies who didn’t see the prey follow along and BAM! Instant “pack hunting,” but with no need for intelligent behavior. The only thing this book is lacking is all those letter jumbles in the middle. What are they called … ? Oh, yeah, WORDS! 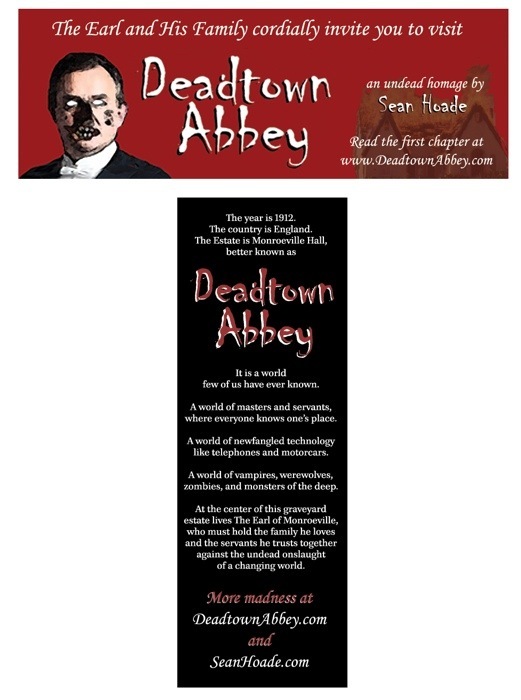 As both of my regular readers know, I promised today to unveil my promotional postcard for Deadtown Abbey today, and here it is! I have included on this sample postcard an indication of where the stamp, postmark, bar code (from the P.O.) and address would go. I ain’t never made bookmarks a’fore. Now I has. But the hours I spent slaving over a hot computer have paid off. I’m going with OvernightPrints.com (which is ironic because I don’t need them overnight) to make up some promotional bookmarks for Deadtown Abbey. I worked and slaved on these and tried different designs and different fonts and then that wasn’t readable enough so I went back and fiddled with it and Photoshop and lots of caffeine and then I finished. Please see below for the finished front and back designs. If you have any design critiques, please write them on a piece of paper and enchant someone else with them. (There are times I ask for critique-like comments. This is not one of those times.) Please do feel free, however, to gush about how much you love it. Thank you. I bid you good day, gentlemen and gentlewomen. As you no doubt know, I am headed for the great city of Atlanta for Walker Stalker Con, the new zombie convention from the Walking Dead folks. I’m debuting my new awesome zombie book, Deadtown Abbey, at the Con. You’ll remember that Reviva Las Vegas! is coming in 2014, and at the Con is going to be the new zombie novel and the book of my zombie lectures. TWO BOOKS! MADNESS! They needed a logo to go on their website that was 300×250 pixels, something that would link back to my website. 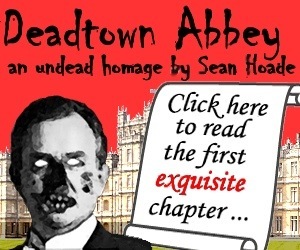 So I decided “Why not do an ad especially for the new novel?” I thought it was a good idea since I have purchased www.DeadtownAbbey.com to put it to work! (The site won’t be up until September 12, so hold off on clicking that there link.) On the book’s website, I will have the first chapter, ordering information, and other related goodies. Your thoughts are most welcome, as always. The first fiction book that I’ll have coming out before The Act or Reviva Las Vegas will be my “undead homage,” Deadtown Abbey. 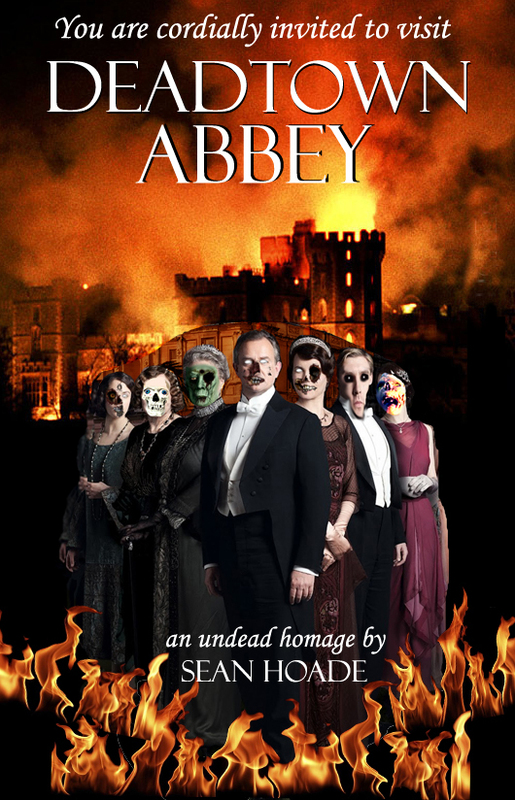 As described in an earlier post, of course this is a fun parody of the wonderful Beebs show Downton Abbey. This book, plus a nonfiction collection of my zombie lectures, will be debuted at the Walker Stalker Con in Atlanta in November. This image uses copyrighted photos, so it’s just to show the concept. I’d love to hear what you think! Doing the Kickstarter project to fund my writing and presentation of my new ZOMBIE BOOK has been fascinating. I learned that my friends and colleagues are the best people on Earth, of course, but more than that, I have learned that the creative world of artists, angels, “free the information” advocates, and others are intertwined in ways I had never really thought about. Something else I learned was that you can’t force others to meet your deadline. I had been writing Reviva Las Vegas! as a collection of novellas, but “novellas” wasn’t the right word. And “four interlocking stories in the same universe, with the same motifs and possibly some secondary characters being shared by some of the stories” seemed a bit cumbersome. And how do I express that one section will be narrative prose, a second in graphic novel format, a third in screenplay format, and a fourth possibly as an Iliad– or Don Juan-like epic poem? I mean, other than by saying what I just said. So here’s the hitch, and it’s a damn valid one: My artist who has been working with me on covers and other illustrations said there’s no way he could knock out 32 or 64 pages of GN art in the time I have allotted for it, which is like 3 weeks. I guess I knew that, but didn’t want to face it. So I’ve decided to give him the time he needs to do that part, and it will also allow me rewriting and polishing time that will make Reviva Las Vegas! successful. But what about the Con? What about being funded to have a zombie book there? Well, what I’m going to (or am asking my sponsoring donors if I may) do is write a short zombie novel and publish my iTunes lecture series as a standalone book. Both of these would be done in time for the Walker Stalker Con on November 1. So far I have gotten unsurprisingly supportive feedback, but I also want to allow for the possibility that someone doesn’t necessarily want their support going to a slightly different project than was first promised. Anyway, please read the letter below, which I sent to all my Kickstarter sponsors, to how I attempted to resolve this dilemma. Now I must go write, for I must have 50,000 words done by October 1! Allow me to take this opportunity to thank you again for your support. You are a kind and generous lot, and you are allowing me to take the time I need to get this book project done. I am all signed up for a table at the Walker Stalker Con from November 1-3 in Atlanta. I got a bit of bad news from the artist who is doing the graphic novel portion of the project, in that he can’t possibly get the art done in time to get it to the printers in time to have it debut at the Con. However, just like sorority girls who had a little too much fun the night before, I have a Plan B. Plan B-3: The original novella-filled book will be out in the first six months of 2014. I was doing this book for the Con, but I was told there was no way to have it done right by then. However, “Reviva Las Vegas!” will be a fantastic, multi-formatted book and worth the wait. All donors will receive the ebook and those at or above $25 will get a signed hard copy as well. This situation, like most in life, have an upside and a downside. Upside: THAT’S THREE BOOKS FOR THE PRICE OF ONE! WHEEEE! And every book will be a winner. Just like you guys. Downside: This isn’t technically what you signed on for. You are helping me get a zombie book to the Atlanta Con, and you are going to receive the RLV book, but it will be Deadtown Abbey and the nonfiction zombie book for the Con, with RLV coming later. So here be my offer: If you would rather not support the changed project, please just let me know and I will return your donation to you ASAP. I never intended to do a bait-and-switch, but I think this new and improved project will be even better. Regardless of how I feel, however, you are entitled to withdraw your donation if you are no longer interested. THERE WILL BE NOTHING BUT GRATITUDE FROM ME! I would never give any one of you a hard time about needing to step away from a slightly different project from the one you were supporting. Okay, so let’s say you’re still in. ALL DONORS will receive an ebook and a signed hard copy of the zombie lectures book. Those under $25 will receive ebooks of all three, in fact. And those at or above $25 will receive ebooks and signed hard copies of all three. All who pledged at the $50 or above level will be thanked in all three books. As for the $75 and above donors (if you decide to stay in), you are going to have a character named either after you or named to your specifications. The choice is ask you to make is whether you would like that to be a character in Deadtown Abbey or in Reviva Las Vegas. I would make it both if I could, but these are separate universes, so it wouldn’t make sense. So please do drop me a line letting me know iin which book you’d like your eponymous character to appear. Also, if you have a preference, let me know if you want your character to be (1) a good guy, (b) a bad guy, or (c) a zombie from the get-go. Thank you for taking the time to read this, and I do hope you’ll continue your support. But there is no problem if you withdraw it. I still love you all like whoa.